Independent garage door repair company AJ’s Garage Door Service in Tucson, Arizona, is pleased to announce they have moved their primary location from Vail, AZ to central Tucson. Along with the new, more convenient location, AJ’s has also launched a new website to better reflect its’ service area for customers. While the company was originally founded just east of Tucson city limits in Vail, the majority of the service calls were coming from residents that were either located centrally or even in the northwest part of town, reaching into Oro Valley, Saddlebrooke and Marana. With such a high standard for prompt customer satisfaction, the drive time was simply too much, and so AJ’s made the decision to establish its primary hub in a more convenient location. Johns explained that despite the fact that this will be a benefit to the vast majority of people with garage door problems in Tucson, there is one downside to launching this new, second location. 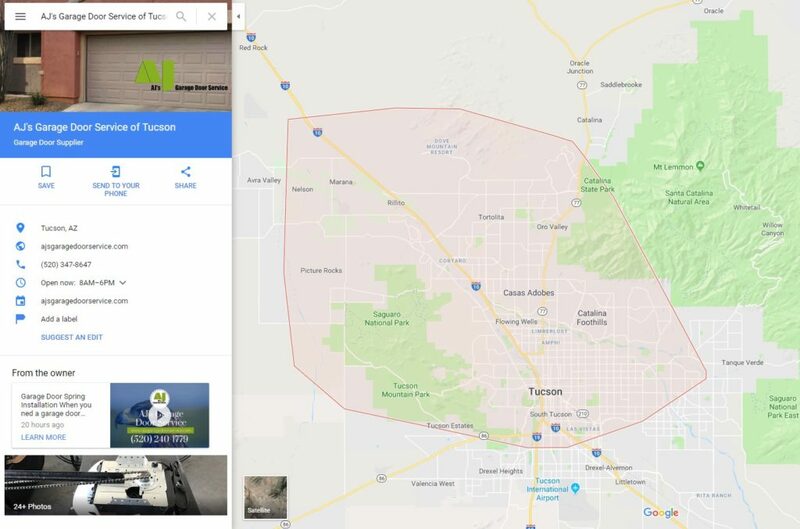 “We want to make it clear to customers that our service area for this location is different – and so we have created a new Google Business listing to make that clear. The collection of 5 Star Reviews we collected from our original location stay with that listing, so people may not recognize us at first, since they are used to seeing all the stars associated with our service.” He went on to explain that the high quality, friendly and affordable service remains exactly the same, and that over time, he’s sure that a new collection of reviews will reflect that on the new listing, AJ’s Garage Door Service of Tucson. AJ’s focus is on garage door repairs, not on new door installations. As a small operation, they made the decision that they would service those customers who are in need of quick, affordable service when something suddenly breaks on their door. Being stuck with a non-working garage door is far more urgent than deciding to install a new door. “When someone starts their day, ready to head out to work or take the kids to school, and they suddenly find that a garage door spring has broken and they can’t get their car out of the garage… that’s a problem. Our goal is to be ready and available to get to them and get things fixed quickly, and for a fair price” says Johns. For anyone in Tucson looking for garage door repair service, including replacing broken springs, hinges, cables, drums, bearings or rollers, or anyone looking to have a new garage door opener installed, AJ’s Garage Door Service of Tucson encourages you to call them for prompt, friendly and affordable work.